This walk: 2013-1-17. Drakeford Bridge, Pullabrook Wood, Woodland Trust, River Bovey, Trendlebere Down, Lustleigh Parish 2000 boundary stone, Hisley Wood, Pudding Stone, benchmark, Packsaddle Bridge, Hisley Bridge, slotted gate post, flood plain, Rudge Wood, large oak tree, 1684 inscribed stone, liverwort, deer sign. 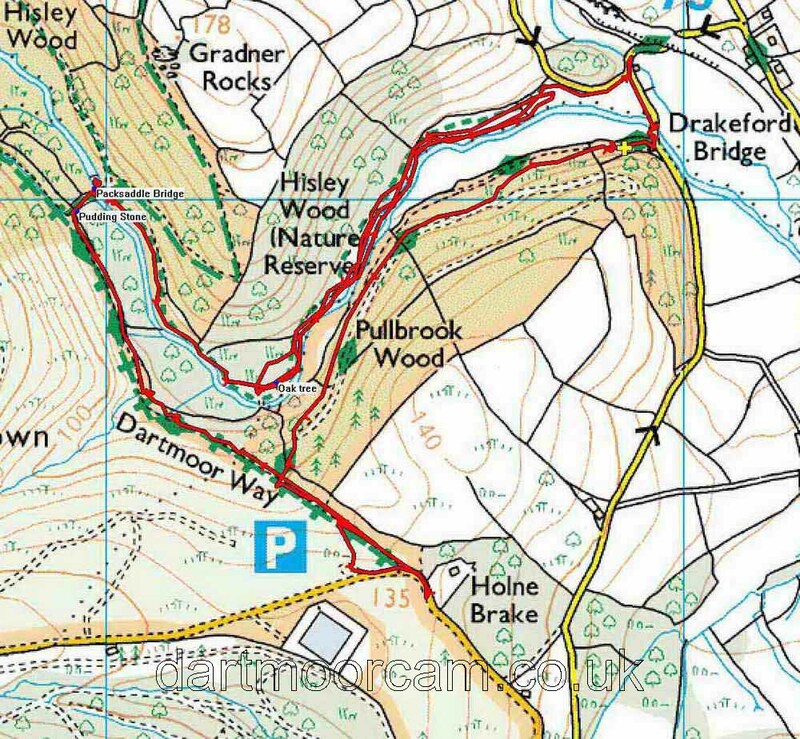 Link to Google Satellite view of the area - the car park is seen just south of "Ivy Cottage"
This walk repeats and expands on the one done on 7 November 2012. Drakeford Bridge, SX 7895 8012, over the River Bovey, from the Bovey Tracey, Parke & Yarner Wood direction. Pullabrook Wood notice at the entrance to the car park, on the left, immediately before the bridge. Bovey Valley Woods Welcome notice. Click on the photo to see a larger version. First view of the River Bovey, after entering Pullabrook Wood. Woodland Trust notice on the gate at the entrance into the wood. A new notice on the gate about path erosion after the recent very heavy rain (more later). Click on the photograph to see a larger version. Notice on a gate, seen on leaving the wood. A view to Trendlebere Down. Looking down a rather steep forest track that was at one time tarmac'd, SX 7850 7937. After stepping out onto Trendlebere Down. Click on the photograph to see a larger version. Lustleigh Parish, 2000 (Millenium) boundary stone - there is nothing on the back of the stone. A "growth" on an oak tree - the oaks here are Quercus robur, English or Pedunculate Oaks. Stream crossing under the bottom end of the track. The view of the flood plain from a gate by the stream. A picture of one very old, gnarled tree with a young replacement alongside. Closer view, such a smooth and rounded stone must have once been exposed to great movement in water? The stone bears a cut bench mark. The bench mark can be seen from across the track. Interestingly coloured stream crossing the track down close to Packsaddle (or Hisley) Bridge, could it be copper as there was a copper mine nearby and this colouration is seen as a result of an adit flooding recently? Approaching Packsaddle Bridge, Hisley Wood is across the bridge and to the left. A slotted gate post was normally one of a a pair of posts. This post has definite oblong slots to accept the gate bars that would have slid into these slots first and were then slid into upside down "L" slots cut into the other post of the pair. Packsaddle Bridge seen from upstream, over the River Bovey. Another view of the gatepost, showing other slots and two modern, iron gate hangers: it has been much-used in its time. View of the bridge from downstream. Plaque on the back of a bench beside the bridge. Interesting knot of trees on the river bank, where the roots probably hold the bank together. Remains of a large, dead tree washed down from somewhere upstream - we couldn't find an obvious spot nearby from where it had come. There was a lot of evidence in this area of quite serious flooding and scouring of the flat ground beside the river i.e. on the flood plain, after the recent heavy rains. This area is also known as Rudge Wood. Click on the photograph to see a larger version. The reverse face of the signboard. Evidence of scouring on the near-river bank. A "tide-mark" on the grass, of scoured bracken stalks. Scoured vegetation, mostly brambles and ivy in this area, not far from the river, which is over to the right. There is a large English (or Pedunculate) oak tree, at SX 78296 79682, with a sizeable trunk. It took about 2� of my "hug spans", meaning about 2� x 1.80 m (or 5'11"). This is a recognised method for measuring the girth of trees on the Ancient Tree Hunt web site: Recognising ancient trees! Therefore this tree is about 4.05 metres (12'3") around the trunk. At a commonly-used estimate of 1-inch (2.5 cm) increase in girth for a free-growing (uncrowded) tree per year in good soil and other good growing conditions then this indicates an age of about 162 years. A caveat: this growth rate does not apply to the youngest trees and nor to old trees that grow more slowly until they cease growing altogether. According to information on the British Hardwoods Tree Nursery web site, oak trees can be expected to live for 200-300 years. Recorded ancient trees can be found on this ancient-tree-hunt.org.uk interactive map. The biggest tree I know of locally (that is on the map) is the large beech in Princetown car park, Tree 110530, with a girth of 4.9 metres (= 196 years old?). An old style road sign, look at the "hinges". A second bridge close to Ivy Cottage, over a small stream that is not named on the maps. A stone embedded in the bridge - THIS 1684 BRIDG WAS REPARD BY THE COVNTY, meaning that the bridge was repaired in 1684. The "4" is back-to-front. Fallow deer slots - this tallies with fallow deer being seen in near-by Yarner Wood when I was collecting ticks there through 2009. A liverwort, believed to be Pellia epiphylla. Also: Wikipedia link. This walk was reached by travelling from Plymouth, up the A38 to Bovey Tracy, going across the first roundabout, turning left at the second roundabout, driving up past Parke (National Park HQ), following the right-hand branch in the road where it is signed "Manaton" ("Haytor etc. to the left), turning right at "Reddaford Water" (the right-hand turn before reaching Yarner Wood), and driving to the first bridge (Drakeford Bridge), turning left into the car park immediately before the bridge, marked by the yellow cross on the map above. Distance - 6.14 km / 3.82 miles.